Next time a company brags about their sustainable packaging, ask why they aren’t growing it themselves. Steelcase, a Michigan-based office furniture company, is doing exactly that as part of a partnership with packaging startup Ecovative. The plant-based packaging foam, set to roll out this month on Steelcase’s Currency line, is made up of agricultural byproducts (seed husks, cotton burrs) and bound together naturally with mushroom roots. “It has the consistency of a rice cake with a brie exterior,” explains Angela Nahikian, Steelcase’s director of global environmental sustainability. 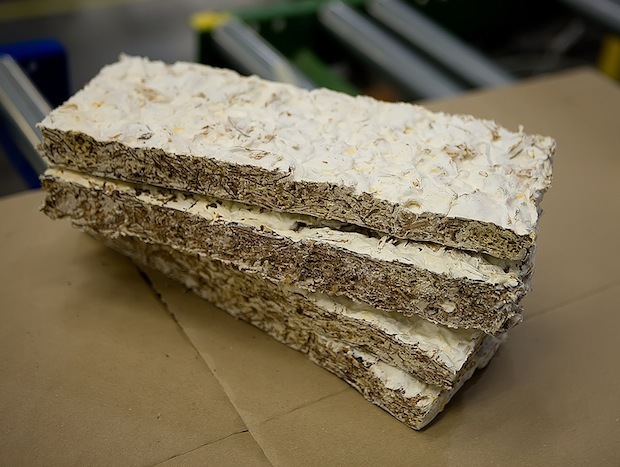 “Any woody, agricultural byproduct can be used as food for the mushroom root material.” You could even eat the Styrofoam-like packaging–but it probably wouldn’t be very tasty. The packaging grows in ambient temperatures and requires zero energy until a drying process at the end. And perhaps most importantly, the compostable material is comparable in cost to traditional packaging. Steelcase eventually hopes to produce the packaging regionally, with different agricultural byproducts used depending on what is available in the area. “There are piles of cottonseed hulls in the South, and they’re often expensive for farmers to get rid of,” Nahikian says. Instead, those hulls might be used to make packaging for, say, an office chair. Next up for Steelcase: bringing Ecovative’s EcoCradle packaging to more product lines. The ultimate goal, explains Nahikian, is to go through Steelcase’s portfolio and eliminate synthetics wherever possible.